Although the use of video technology for decoration did exist in the days of VHS, things really didn’t take off until DVDs entered the picture. Finally, a program could be played over and over again in a loop without the need for constant rewinding. TransLumen Technologies seeks to differentiate themselves from the virtual fireplaces and “ghoul logs” on the market by doing something other than the standard video wallpaper DVD. Rather than doing an actual video that’s mean to be watched, they use a series of images to create an illusion of a still picture that changes at times. Apparently, there’s no threat of screen “burn-in” since the images are always changing. The back cover says that these were intended for use on widescreen televisions and that the changes can’t be detected on them. As I have an old school tube TV, I can confirm that the disc can be used with it, although the transitions are somewhat easier to detect (especially if you constantly watch the screen). As you’ve probably guessed, one doesn’t technically watch a TransLumen DVD. Instead, it’s better if you only glance at the screen from time to time. This makes it best suited for use “in the background” at a Halloween party or in the waiting area of a haunted house. Although the back cover says a “cabinet, mirror, window shade or other concealment methods” are not required (presumably a reference to the Big Scream TV series and other such titles), I suspect that many Halloween enthusiasts will be tempted to place a fake picture over their screens in order to help give the appearance that this is a haunted painting. A fun way to further enhance the effect is to position a mirror across the room from the screen playing A Halloween Moon. People are naturally drawn to mirrors and as they look at themselves, they’ll probably notice that the image has changed since they last saw it. A Halloween Moon starts off with an opening title screen and and explanation of the technology on the disc, followed by a 30 second time lapse version of the entire “show.” This entire segment (including the opening) counts as the DVD’s sole chapter stop. Next comes the main program, which clocks in at about an hour and automatically loops (skipping the introductory screen) after the conclusion. We’re greeted with a black and white scene depicting a deserted house on a lonely road with a full moon overhead. However, this gradually shifts into color (and said colors change shades over time) while scary sound effects and music play. Although the audio fades out completely after five minutes, it returns every now and again. The initial return (tolling bells) is a clever way of drawing people’s eyes back to the screen to both take notice of the changes and to get them prepared to check back at other points in time to see how else the “painting” has changed. However, the sound/silence ratio (and duration) constantly changes after that, rather than predictably occur every five minutes or not long after a new image appears onscreen. It’s a clever touch that might take some awhile to get used to. Of course, those who either want no audio or who wish to use a different soundtrack only need to hit “Mute” on their remote. I was impressed how TransLumen Technologies managed to stretch out the amount of sound effects over the course of the DVD without it ever seeming boring or skimpy. They even manage to pull of using two versions of “Toccata and Fugue in D” (the classic spooky version and a lighter take on it) and not have it seem repetitive. New effects or music are always layered in whenever something is repeated. Said music is excellent and ranges from “pounding and spooky with wordless vocals” to “eerie yet mystical.” The program’s final segment uses a mix of old and new material to make for a great ending. However, I do have a few issues with the choice of certain effects. For example, the barking dog effect that appears about fourteen minutes in sounds like a regular dog barking. Although its sudden appearance after a lengthy silence is genuinely surprising, I would have preferred something a little more vicious-sounding. Also, some effects are much louder than others, like the door slamming about forty minutes in (which implies a use of effects from multiple sources). But let’s not forget the visual side of things. Many other spooky images pop up over the course of the disc’s running time, ranging from a strange reddish light appears in the upper window of the house to the very creepy “skull in the moon” effect (along with plenty of other spooky touches I won’t describe). I did like how, at the end, the various scary things fade away and the image gets monochromatic again, which makes the transition back to the beginning very seamless. This 2007 DVD is a very impressive first effort by Translumen, with an excellent widescreen transfer and is scary enough to please adults while not being too intense for all but the youngest of children. As it’s a DVD-R release, some players might display “lines” onscreen during the first play-through and it is advised that you play A Halloween Moon at least once prior to the visitors arriving. Thankfully, the label is printed onto the disc rather than being glued on. I also think it would be a nice creepy touch if future Halloween-related titles had some objects that appear and disappear from time to time without sticking around for the final picture. Please tell us a little about the company. Carol Sherman: TransLumen Technologies was founded and the first patent was filed at the beginning of 2000 followed by a second patent application. The initial art on Video Compact Disc (VCD) for internal use was shown to Kodak, Viacom, Disney and Panasonic. They verified its competitive uniqueness via patent and internal technology searches. In 2002 – 2003 TransLumen was issued U.S. Patents #6,433,839 and #6,580,466 for graphic imaging algorithms. On 02/02/2002 Sony Galleries sponsored an exhibit featuring the first public implementation of TransLumen’s Fluid Stills® technology. The show exhibited three pieces of the VCD based art, two on TVs and one projected. TransLumen Participated in a Boeing “think tank” to create future technologies. TransLumen successfully completed a collaborative 3-month test with NEC on plasma screen burn-in mitigation. We then presented a simulation on the Access Grid Facility for the Office of Naval Research along with one to the Technology Research Education & Commercialization Center. TransLumen also collaborated with Boeing Integrated Defense and QinetiQ for Command/Control applications during this time. In the years 2004 – 2005 TransLumen received a NASA Illinois Commercialization Center Award and participated in a DARPA Cognitive Performance think tank for Augmented Cognition. The first functional peripheral awareness indicator integrating Subthreshold Extreme Gradual Change (STEGC) was developed. Since 2006 TransLumen received a State of Illinois’ Homeland Security –Innovation Product grant, made presentations to and submitted “white papers” to Augmented Cognition International and the World Bank, received an Illinois Technology Development Alliance grant to advance use of the v-INDICATOR™ for universal mobile device use, received an Office of Naval research contract Broadcast Agency Announcement (BAA) for perceptual training and partnered with Lockheed Martin to conduct further development associated with the perceptual training BAA. In addition, we have launched the game “UAV Fighter,” an Apple App for the iPhone, iPod Touch and iPad. Please tell us a little about your “Fluid Stills” technology. Carol Sherman: We currently hold three patents on the Fluid Stills® Sub-threshold Extreme Gradual Change (STEGC). With their pictorial roots, the pieces produced in this manner can be very fluid yet non-disruptive when used as ambient art. The pieces are a part of the “Stillism”, “video art installation” and “video painting” genres. Each frame has all of the qualities of a photograph, painting or other piece of still art while the work as a whole embodies the temporal flow of the motion picture. TransLumen developed an art DVD for the Chicago Field Museum using its Fluid Stills® technology. A Fluid Stills® Chicago Skyscape for the renovation and re-branding of Chicago’s Holiday Inn Express Hotel was installed in 2007 (and is still running) at 640 N. Wabash. How did the idea to do a Halloween title come about? Doug Siefken: I have always thought that Halloween was the most awesome of holidays – loving the excitement of it. I wanted to do an art piece that lent itself to the “festive” (scary really) aspects of Halloween but suitable for all ages. What’s the creation process like for your products? 5. Compile video using MPEG2, H.264 etc. 6. Distribute as digital file or DVD/Blu-ray etc. Are the art and audio original or were they licensed from another company? 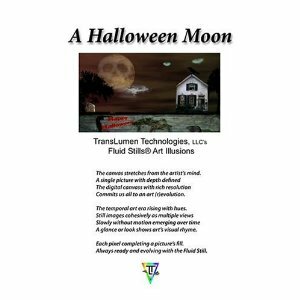 Carol Sherman: The art in A Halloween Moon was based on about 15 original photographs by Doug Siefken and a handful of licensed art. The audio is a collection of original music and sound effects by TransLumen combined with licensed pieces. The licensed pieces came from sound effect/audio and art collections. Which companies were they licensed from? Carol Sherman: The audio was licensed primarily through Sony and Sonic libraries and mixed with original TransLumen content. Are you planning on switching from DVD-Rs to DVDs at any point? Interesting! How are these a “green” technology? Carol Sherman: The images when played back via certain file formats (not DVDs or Blu-ray) are “green technology” because only the change is transmitted and there is very little change compare to full motion video. High-def images have been successfully played over 14400 baud modems (over telephone). Do you have any plans for further Halloween (or other holiday)-related releases? Carol Sherman: We are planning to release product for all major Holidays and currently are producing and /or translumenizing content for Long Glance Media. Special thanks to TransLumen Technologies for the review copy!